The 18-karat pink gold Horsebit Necklace from Gucci is an attention-grabbing piece. Featuring quality materials like black diamonds and black synthetic corundum formed into an obelisk shaped pendant, the necklace is made to last. 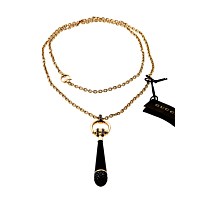 Gucci's artisans crafted each link of the necklace's gold chain. In addition, the horsebit design elements are a subtle reminder of Gucci's fearlessness when it comes to creating distinctive jewelry. With the inclusion of black diamonds, the company's designers made sure that the piece shines when worn.